Are Germans dog lovers? I would say that on average the answer is an unequivocal “yes.” Even those who do not personally profess to love the four footed fur people that we call dogs recognize that dogs should be treated with kindness and compassion. In Chile I had become used to the poorly disguised comments on the streets as I walked my two mixed breed dogs, Polly and Theo, down the street in Santiago. “Ay, los leones!” was a common exclamation. I became disgustedly immune as people frantically tried to put a tree between themselves and my dogs. There were also the people who jumped behind their walking partners, apparently willing to sacrifice their friend in the name of their own safety, as well as those who dramatically and with purpose crossed the street in order to not share the same pavement with my four footed companions. Of course, there were the occasional dog lovers who would give me a smile or a nod, but they were not the norm. Chile, despite being a wonderful country in many ways, is not dog friendly, and the people view any dog, but especially one that is not small and expensively bred, as vile and dangerous. My two dogs were rescued from the streets of Austin, Texas. Despite their humble beginnings, their manners and comportment spoke for themselves as to their societally-friendly demeanors. Although the United States is not the dog-adoring nation that is Germany, being in Chile was the first time I had encountered such endemic anti-dog sentiment. 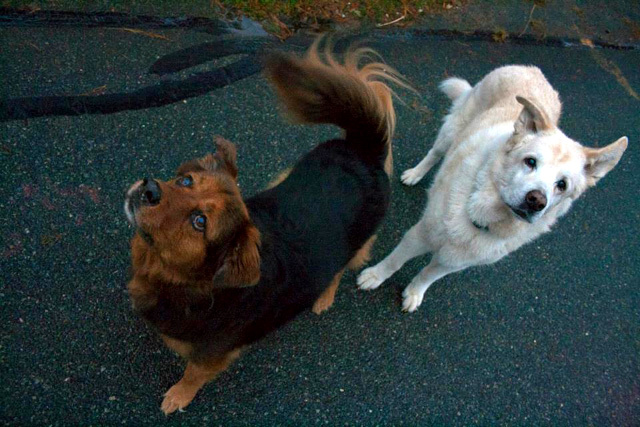 It was a painful experience to feel that my dogs were pariahs as we would walk to the park. The move from Chile to Germany was difficult, but from the canine perspective, it couldn't have been a moment too soon. Fast forward two years to my life now in Berlin. Sadly, Theo is gone, and Polly is very old. Thankfully, Theo was able to share in the glory of the German attitude before he died. Theo was a white German Shepherd and in the year that he spent in Germany I am sure he relished every moment of the attention that the dog loving Germans lavished on him. Polly is more of a genuine street mutt. She weighs about 25 kilograms and walks with a distinct limp, resulting from severe arthritis that developed not only from age but from the fact that she was born with hip dysplasia that demanded surgery before she was a year old. Now, instead of people fearfully exclaiming that lions are approaching, the Germans almost unfailingly give a smile, or an “ah, Götchen,” as she hobbles by. Now that she is an only-dog, she too loves the admiration she receives from onlookers on the street. 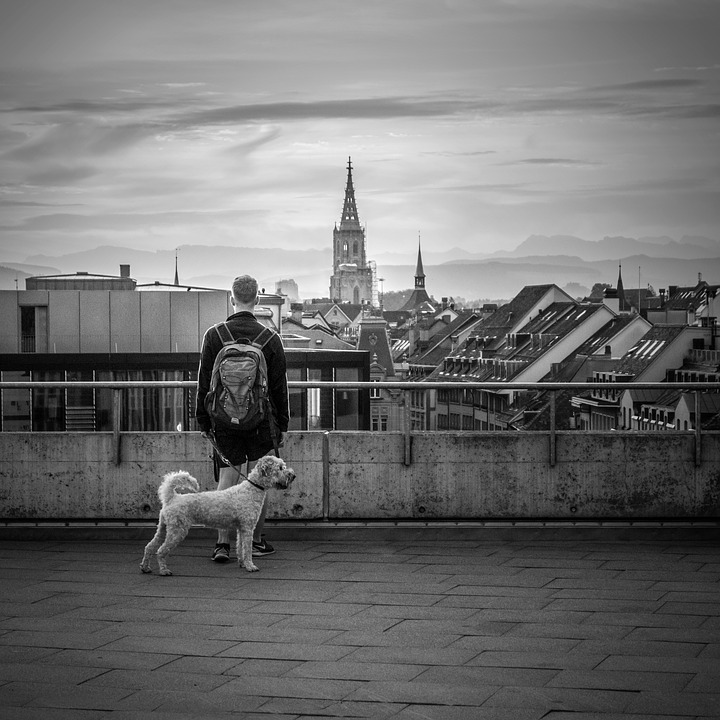 If you are a dog lover, Germany is one of the best countries in which to live. Not only Germany, but Berlin seems to be perhaps the best city. Why? Well, Berlin has the most green space of any capital city in Europe for one. It has over 2,500 parks, and the Spree and its various tributaries meanders through the city, making an escape to nature a daily possibility rather than a stolen weekend moment. One can meander the city streets, canine friend in company, with or without a leash regardless of the leash law, depending solely on how well behaved your friend is. They can come with you to the mall as you shop or wait patiently outside as you dash through a supermarket. They are fantastic company, especially if you are new in town, and help in the acquisition of new human friends. It is said that Germans are not initially warm. That may or may not be true, but certainly this stereotype disappears if you are walking with your furry companion. The faces of old, middle and young alike light up at the sight of your dog approaching. In both Berlin and Magdeburg, where I lived before moving to Berlin, all of my initial social contacts were formed with people whom I befriended related to my dogs. In fact, as I write this article Polly and I just returned from a lunch date at a friend’s apartment. 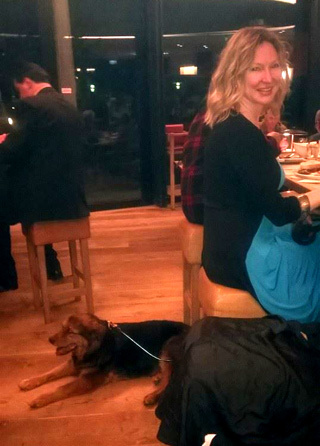 This friend is an example of a wonderfully friendly, dog-loving German who has become a regular walking companion. True, the dog culture in Berlin has slight room for improvement. What I mean is that it would certainly be convenient if all the parks would provide doggy bags and trash receptacles so that the steaming “chocolate sundaes” left by our canine friends could be easily removed. But, I believe that is the only actual improvement needed, and it is a small one, since doggy bags are easily purchased, and Berlin does a fairly good job at providing trash receptacles, although there have been occasions when I have been frantically scanning my surroundings in search for a bin to rid myself of my stinky bag and there are none to be found. Returning to Polly; she is old. She walks slowly and gets up even more slowly. She limps because she has arthritis in all four legs. She receives daily pills for the pain that help but do not eliminate it. However, she still loves to go outside and sniff, meet other dogs and generally lord over the neighborhood. Everywhere we go we are given a warm reception. There is one anomaly, however: as Polly and I stroll slowly through the city, it is not uncommon that some well-meaning, usually geriatric person comments that I should not let her suffer and that the time is coming when I will have to put her down. True as that may be, I am taken aback to hear this, since I come from a country where saying it is taboo. Furthermore, the sparkle in Polly’s eyes, the lofty curve of her tail and her eager sniffing of fascinating mysteries on the sidewalk are still strong. So, it is a mystery; why is it that such a large number of people, who are nearer to death than birth themselves, are concerned about the fate of an old dog? Nevertheless, although these remarks were initially jarring to me, I now understand that the well-meaning comment-makers are expressing compassion and simply looking out for what they believe is Polly’s well-being. So the stereotype still fits; Germans certainly are a dog loving people.